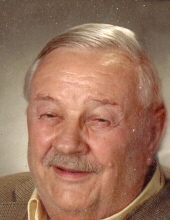 John Edward Houston, of Pierce Township, passed away on February 5, 2019 at the age of 83. John grew up in Georgetown, Ohio and was the son of Judge John Howard Houston and Mary Irene Houston (nee Mignery). He served in the U.S. Army, stationed in Germany, and was in the Army marching band serving from April of 1956 until February of 1958. John was involved in community theater and had a radio show on WOBO. He was an elder and bell ringer at Calvin Presbyterian Church. He also worked at SEM pantry in Mt. Washington. John leaves to mourn his passing, his wife of 35 years Frances C. Houston (nee Dewar), his children: David (Joy, nee Snider) Houston, Todd M. Houston, and Jill Cholmondeley, his grandchildren: Mandy (Steve) Eubanks, Jimmy Edward Houston, Ashley Houston, Matthew Cholmondeley, and Jason Cholmondeley, great-grandchildren: Evelyn Eubanks, Norah Eubanks, and Zylon Cholmondeley, and his sister Mary Jo (Robert) Grimes. A memorial service will be held for John at Calvin Presbyterian Church, on Saturday February 23, 2019 at 1:00 PM. In lieu of flowers, please donate to Calvin Presbyterian Church 1177 Ohio Pike, Amelia, OH 45102, SEM Food Pantry, 7770 Beechmont Ave., Cincinnati, OH 45255, The American Diabetes Assoc., or Hospice of Cincinnati at Anderson Inpatient Care Center. "Email Address" would like to share the life celebration of John E. Houston. Click on the "link" to go to share a favorite memory or leave a condolence message for the family.